A single bed apartment can be changed easily into a three-bed apartment. The exterior private space can expand as well by adding balconies. This allows the families of the different floors to interact with each other. Different to the previous lay out, we add a common semi-public space on each floor. Fixed spaces and flexible spaces are distinguished in the design process and tend to formulate the spaces. The sense of flexibility can be studied in a more thorough way in the future. Densities of users are studied in reference to usage proposals that are important data in order to make sense of the target-group. Light in interiors and cross-ventilation are regarded with the ecological formulations; there may be more effort on the issue in the future. Sections are great tools to be explicit in the presentation, which is mostly enhanced. The notion of “semi-flexible” is introduced. Even if the definition is not fully clarified, the attempt may have distinguished effects. 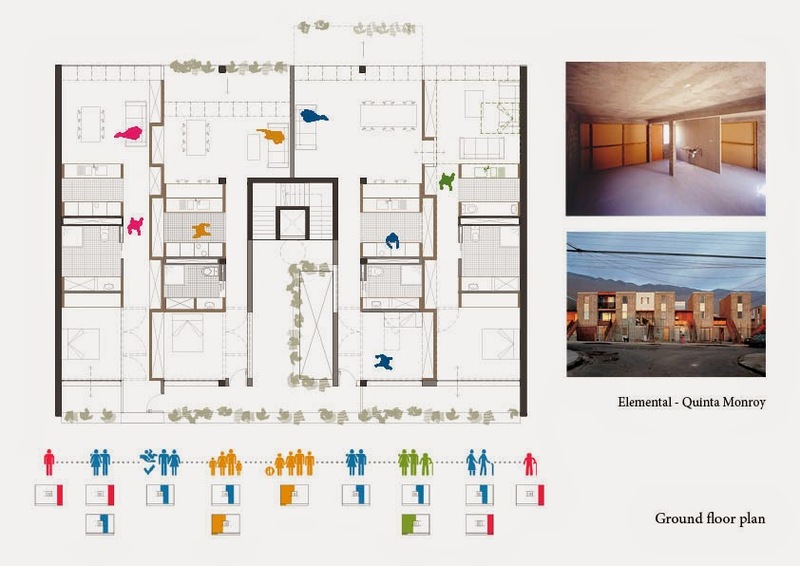 The concept brought the daylight and space enhancement to communication spaces and properly adjusted four equal dwelling layouts to three variable dwelling units, more appropriate to various living situations. However a bit questionable are the new dispositions itself - e.g. the entrances to flats could be in the living area, not in the bedroom part, better access to separate housing unit within the appartment, etc. but that can be due to time shortage for the elaboration of the design concept. A desire to provide alternative apartments for a mixed age group leads to a realistic design intervention with ideas well represented with 3-d sketches and digital drawings. The attempt to achieve a degree of flexibility, thus allowing for alternative apartment sizes, within the existing framework of structure, enclosure, vertical service risers and circulation core, by using the FABLAB modular system both internally and for the external fabric, is convincing. Some questions arise though. It is not clear how a 1-bed apartment can easily convert to a 3-bed apartment? Does the living space remain the same size for example? It would need to be bigger. Showing optional layouts, over 3 floors say, would have helped our understanding. Bathrooms appear to be overly sized? Smaller ones may have helped the arrangements. More time would have allowed for detailed study of the possible options for the modular system also since this is such a key aspect of the proposal. The use of the roof as communal garden and the opening up of the space adjacent the circulation core create good communal spaces that provide a link to the public realm. The section study and 3-d sketches explore well how the carved-out space adjacent the circulation core would allow good daylight into the dark centre and encourage social interaction both horizontally and vertically. 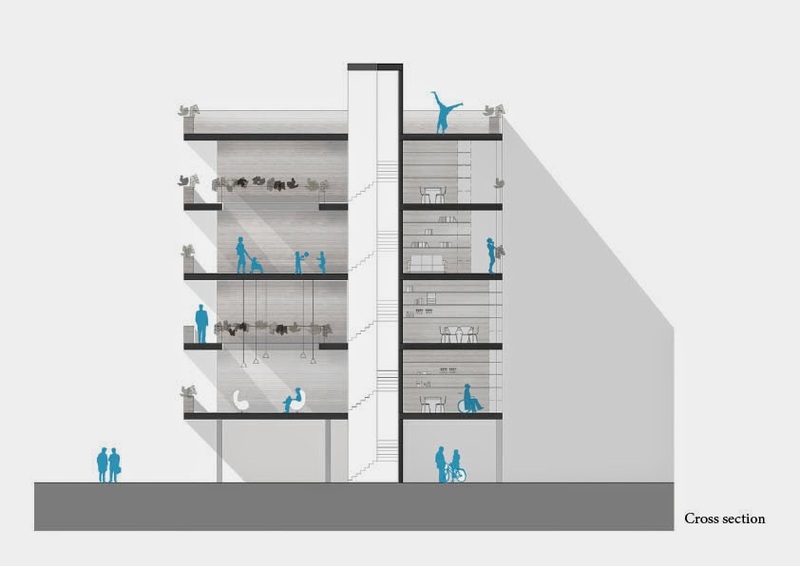 Could such vertical interaction occur within apartments too, this enriching the flexibility aspiration? Overall a very good response within set constraints and excellently represented. Apartment are very beautiful and big , you share some more inside images its helped to student because many student want accommodation now a days .